The design of Varios 570 is compact yet versatile; the large power dial, clear indication and large water volume knob offer easy, comfortable and patient-friendly power and water supply adjustment. - Handpiece is washable in the thermodisinfector and autoclavable up to 135? iPiezo engine, ensures stable frequency, automatically adjusting to the optimum frequency for each tips available to give an excellent, tactile feel. It also assures an optimal and stable power output by monitoring the loading of the tip and adjusting it. NSK LED delivers natural daylight quality light bringing significant advantages to the way you work. LEDs generate natural daylight quality light which assures clearer vision when compared halogen light. LED light sources are longer lasting and more durable than halogen bulbs. 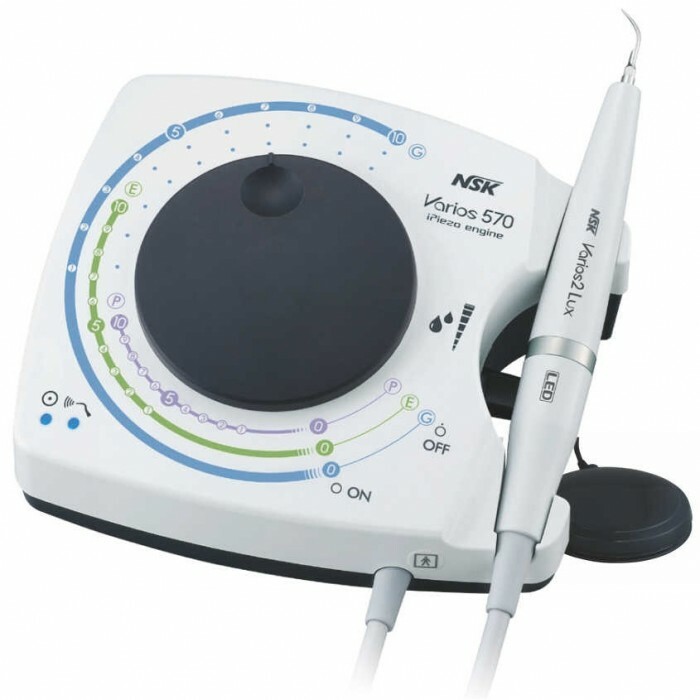 Click the button below to add the NSK Varios 570 Lux Led Ultrasonic Scaler to your wish list.